Once again with K&M, I am not disappointed with the quality of their stands. This one is just perfect to put a mic on a guitar/bass amplifier, a kick drum or a double bass. The adjustable height makes it really versatile. The base is not large so you can use it in tiny place, for example between the stands of a drum when you want to record the resonance skin of a snare drum. The weight of the stand is quite heavy, which is maybe a bad point, but it allows you to use it with a boom (I did it many times and the stand never fell down, even with a heavy mic and a long boom). In my opinion, if you work in a studio or in PA, you need at least one of these stands. Heavy and stable, good for table-top usage. Adjustable height, up to a maximum of about 30cm. I use this with a Superlux S502 stereo microphone and it is very useful. 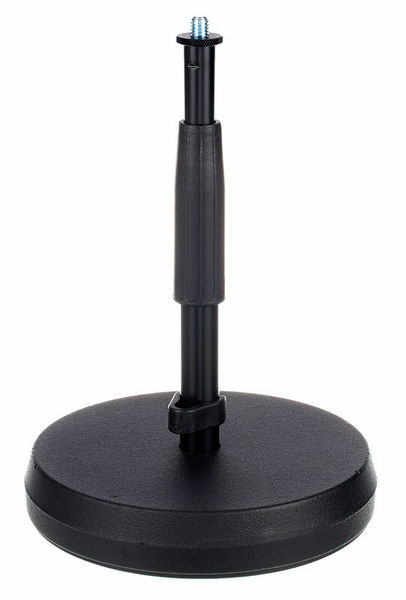 The rubber on the foot of the stand absorbs some of the vibrations, but not too much. You definitely don't want a child slamming the table while you are recording. The system for extending the height is a plastic sleeve that screws on a fillet. It gets the job done. ID: 316056 © 1996–2019 Thomann GmbH Thomann loves you, because you rock!